Elite Writing Services – LinkedIn Profiles, Executive Resumes, etc. After leaving a career in the military, finding a civilian job — especially an executive management position — may seem daunting for many former service members. Fortunately, having previous experience in the military may actually put veterans at an advantage when it comes to landing some executive jobs. The military instills knowledge and skills in its members that make them more qualified candidates for certain civilian jobs — many of which are high-paying executive positions, like the 8 listed below. Like the military, a company can’t operate without a reliable and competent logistics team, lead by an experienced operations manager. Operations managers are in charge of their company’s production of goods or services, which means leadership is their top quality. Service members who have managed operations and supply lines in a war zone understand the importance of their role. In the business world, they’re responsible for making sure products meet client expectations and the production of those goods run smoothly. They oversee different departments within their company and are in charge of making sure all departments and final products meet safety and environmental regulations. A bachelor’s degree in a related field and some work experience are required to land this job. You’ll also need to be okay with traveling, as this job sometimes requires it. Every military base, no matter how big or small, relies on a sophisticated communications headquarters to run smoothly. These radio and computer systems require extremely competent personnel to operate and troubleshoot when problems arise. Their experiences are often unmatched to their civilian counterparts, making them ideal candidates as a computer information systems manager. IS managers work as the head of the information technology department. They ensure that program applications and modifications all run smoothly by developing plans for their teams and projects. Computer information system managers need to have a comprehensive knowledge of information security, network and mobile device management, and antivirus protection. They also need to know how databases and workstations work, to make sure they’re performing optimally. IS managers are often “on call” in case any IT issues arise, meaning there is always a chance of working weekends, nights or holidays. To qualify for this job, you’ll need a bachelor’s degree in a tech field, plus critical thinking and communication skills. It’s also valuable to understand how customers experience technology at different touch points. Construction supervisors are responsible for overseeing teams of people working on various building projects. A considerable proportion of their work is administrative, such as monitoring quality control, preparing estimates, creating employee and project schedules, and reviewing building designs. These tasks are not that different from leading a platoon or company in the military. Officers and Non-Commissioned Officers often balance these responsibilities in high-pressure environments, making them ideal for this challenging job. Other niche skills, knowledge and even certification in heavy equipment operation, electricity, plumbing or other specialties can be an asset as well. A construction supervisor is often given a budget to work with and proceeds from there, acquiring all labor and materials within the budget while ensuring that the work and materials are up to standards. Construction supervisors work directly with clients, so customer service skills are also important. The ability to multitask is imperative for a construction supervisor, as well as having a cool head under pressure. Planning is the key to operational success on the battlefield. Military leadership is trained to understand the short-term and long-term tasks in order to accomplish a mission. This foresight and tenacity for planning are skills that would make for a great career as a financial advisor. Financial advisors work with clients to help them achieve their short-term and long-term financial goals, such as home renovation, college funding, or retirement. Advisors typically work at banks or insurance companies, where clients come to find help in choosing investments and to ask questions about laws related to investments. A bachelor’s degree in a related field is a requirement for this position. You may also have to pass various exams before being hired. You’ll need computer skills, as well as good communication skills with people. You’ll need to know federal, state, and local laws that apply to the job and industry. Working on a military airfield requires you to understand the capabilities of a wide range of aircraft. From the Osprey to the M-35, airfield personnel need to understand how these machines fly and how to service and maintain them to keep them operational. Besides the aircraft, keeping track of the pilots, mechanics, flight line crew, and the logistics make airfield personnel ideal aerospace program managers. These managers are responsible for leading aerospace projects. They are expected to know the essentials of air transport, airport operations, and revenue management. Aerospace program managers oversee funding, construction, and grant administration, working hand-in-hand with planners, engineers, government officials, and environmental scientists. This job requires work full-time during business hours and often many additional hours to meet the needs of a given project. For this position, you’ll need a bachelor’s degree in an engineering field and to register as a professional engineer in your state. A substantial amount of previous experience is preferred, so any applicable military experience will help you stand out as an applicant. The goal of a management consultant is to improve a business’s management processes, productivity, and image by pinpointing any current problems or potential future risks and creating a plan to solve those problems. People in this job provide businesses with concise reports showing where problems are, forecasting how these problems will affect the company, and proposing solutions to those problems. This position requires effective communication and public speaking skills, proficiency with computers, knowledge of mathematics, and the ability to work well with others. You’ll also need a degree in a related field and a Project Management certification. Serving overseas often requires service members to work with units from different branches of the military and even from different nations. Managing the operations and working cohesively to accomplish the mission make these military leaders ideal business development managers. Working as a business development manager means operating in conjunction with other company managers to keep track of business development. Business development managers create plans for the company that are designed to create more revenue and improve customer satisfaction. These managers need to work well on a team and exhibit leadership skills to help motivate staff members. A bachelor’s degree in a related field is required, and prior experience is encouraged. You’ll also need to know your way around a computer, as you’ll constantly be conducting research and writing reports. Military service prepares service members to combat all possible threats. In a combat zone, intelligence personnel are tasked with observing, collecting, and disseminating real-time actionable intelligence to units on the ground. A civilian job which presents similar opportunities is an intelligence analyst. While this job mostly involves working in an office, intelligence analysts often go out to perform field research and conduct investigations. A flexible schedule outside of work is necessary for this job, as relocation and travel (locally or internationally) are sometimes required. Communication, research, and report-writing skills are imperative for this job, as analysts are responsible for presenting results to others. 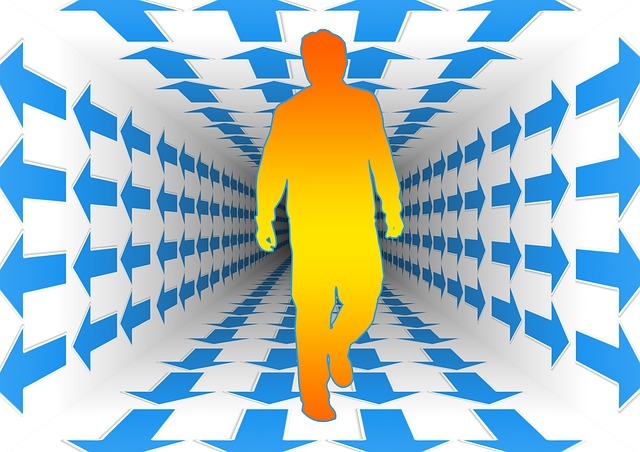 Some intelligence analyst jobs mandate having a security clearance, as all research findings are considered classified and should be kept confidential. A bachelor’s degree is typically a requirement unless you have prior experience. You’ll also need to receive training and earn the proper certification before beginning work. While finding a job after the end of a military career can seem intimidating, there’s no reason to believe that you won’t be able to land a job that pays well. Military training teaches skills that come in handy for many civilian jobs — and employers in these fields realize that the specialized training afforded to many service members can make you ideal for an executive or management position. Brad Miller is a Marine Corps veteran who comes from a family with a long tradition of service. He and his brother created The Military Guide as a “straight shooter’s handbook” to provide helpful resources to service members at every stage of their military career. 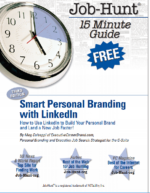 Get my FREE EBOOK to help you leverage LinkedIn, and never miss another one of my articles on job search, personal branding, LinkedIn, online presence and so much more. Read all about the ebook here. 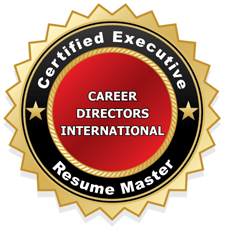 Land faster with a customized-for-you GET STARTED / GET UNSTUCK Executive Job Search Strategy Session! “LinkedIn Secrets” is FREE when you purchase my “23 Ways” ebook! 20 Little-Known, Insider Tips to Accelerate Your Executive Job Search. 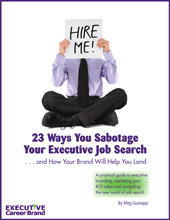 My ebook will help you land a great-fit new gig faster! When Was the Last Time You Updated Your LinkedIn Profile? Over 50? Is Personal Branding for Boomers, too? How to Use LinkedIn to Build Your Personal Brand and Land a New Job Faster! Wondering if you’re using LinkedIn to your best advantage in your executive job search? 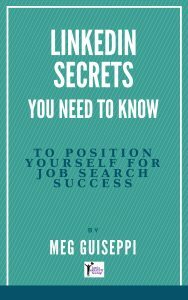 My popular ebook will help you leverage this most important social network and accelerate your job search. 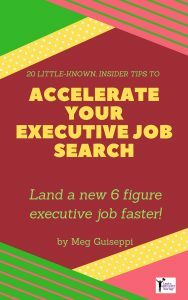 Get my FREE ebook and never miss another one of my timely and valuable articles on navigating today’s executive job search (personal branding, LinkedIn, online presence and so much more). Read all about the ebook here.